Clientes relataram a presença de problemas de qualidade neste eBook. Esse eBook possui: Erros de digitação, Qualidade de imagem ruim, Navegação perdida. This is Service Design Thinking introduces an inter-disciplinary approach to designing services. Service design is a bit of a buzzword these days and has gained a lot of interest from various fields. This book, assembled to describe and illustrate the emerging field of service design, was brought together using exactly the same co-creative and user-centred approaches you can read and learn about inside. The boundaries between products and services are blurring and it is time for a different way of thinking: this is service design thinking. A set of 23 international authors and even more online contributors from the global service design community invested their knowledge, experience and passion together to create this book. It introduces service design thinking in manner accessible to beginners and students, it broadens the knowledge and can act as a resource for experienced design professionals. Besides an introduction to service design thinking through five basic principles, a selection of individual perspectives demonstrate the similarities and differences between various disciplines involved in the design of services. 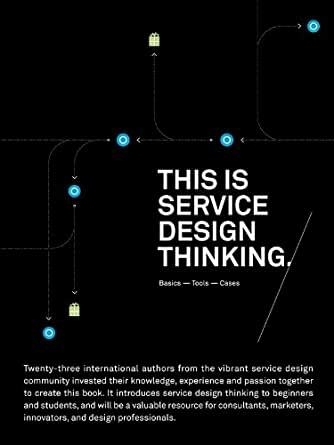 Additionally, the book outlines an iterative design process and showcases 25 adaptable service design tools, exemplifying the practice of service design with five international case studies. The book concludes with an insight into the current state of service design research and sets service design thinking in a philosophical context. O livro correspondeu ao que eu estava procurando. Ele fornece bastante ferramentas, mas não explora elas a fundo. Recomendo para quem trabalha com serviços e gostaria de ferramentas para melhorar ainda mais a experiência com o cliente. A good read, enlightening and practical. I recommend this book for those looking to design and develop services and them measure its results. Service Design Thinking is an emerging field that recognizes that the product design principles need counterparts in designing services for customers that are user centric; that are delightful, pleasurable, usable all the while serving utility to the customer. Understanding the value and the nature of relationships between people, organizations is central to designing services. Viewing your service through the customers’ eyes, and designing the experience to be consistent for the customer is the essence of service design thinking. Service Design methods and tools are ways for a business to gain a comprehensive, empathic understanding of customer needs. Service Design as a practice at consulting firms results in design of systems and processes aimed at providing a holistic service to the user. - using a emotional customer journey map while designing for a new service offering at a bank, to understand what are people really trying to achieve, how, and what do they use. What are they experiencing and feeling while trying to reach the desired outcomes. 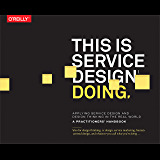 The other sections of the book cover the principles of Service Design, the participants (product designers, interaction designers, graphic designers, social designers, strategists, operational managers, design ethnographers ) and the principles of service design. The section on the tools for service design falls short. It lists all the popular design techniques – stakeholder maps, customer journey maps, personas, storyboards etc and few I haven’t been exposed to before. The explanations and examples are not adequate though. I have seen other books cover the methods and tools much more comprehensively. I heard about service design back in Italy. I actually didn't understand what it meant. For me, it was marketing. It was design thinking. It was "smoke". However, I kept this book under the radar for later reading. It took a week to finish this book, according to several websites, one of the fundamental documents on service Design. Now the definition is clearer and more real in my head. Don't feel like I know service design after reading this book, however, I can see where to use it and how I can include this tools into my very own (and eclectic) toolbox. 5,0 de 5 estrelasA good tool and a good design. This book provides a really good overview of a lot of techniques and skills involved in service design. Even better, the design of the book itself is simply stunning. There was a lot of thought put into how to organize this book and the information design. I've never enjoyed just flipping through pages or finding a section as much as I have with this book. Whether you're buying this for yourself or for someone you know, if you're interested in service design specifically or just design in general, you will find something to love in this book. Although the service design field has evolved A LOT since this book was published, it is still a must read for everyone that wants to understand more this beautiful and complex field. 1,0 de 5 estrelasPoorly written. The words service, service design, service designer are used in practically every sentence. 1 sentence I counted the word service mentioned 5x. A pathetic attempt at establishing a common vocabulary, especially since that attempt yielded awkward terms, not at all leveraging common UX / CX terminology. At times, it is unclear what topic they are covering: Manufacturing design methodologies or technical product development methodologies. Also, it probably could be trimmed down to a third of whats there. A lot of filler pages. Content has bold AF statements like "if you do this, it will yield better customer retention" WITHOUT referencing any actual data to support it... There are cases at the back, supposedly, but i haven't made it that far. Even so, they should reference them with statements like that... otherwise its just literary nonsense. The awkward phrasing makes it difficult to read, especially since they are all new, not at all leveraging existing terminology. The overuse of terms like design and service just show a lack of professional writing skills... not sure if the editor or the writer should be to blame for that. Also, the paper quality itself is glossy... smh... which creates a glare or a sheen regardless of normal lighting situations. Even the book itself is bizarrely formed... which makes it difficult to just pick up and read wherever, meaning they didnt even follow their own methodologies when designing the physical book. It is OVER designed, meaning that they were more interested in creating a pretty print piece rather than good quality content... somehow, these "designers" forgot that content is king... a rather basic rule. There are some good tidbits here though, you just have to wade through ALL the other junk to get it.